Kitsch is definitely also the word for one brand that is getting more and more popular among fashionistas since this summer. Pinko has been all over Instagram lately with their 'Love Bags' that can easily be recognized thanks to the striking golden bird clasp. 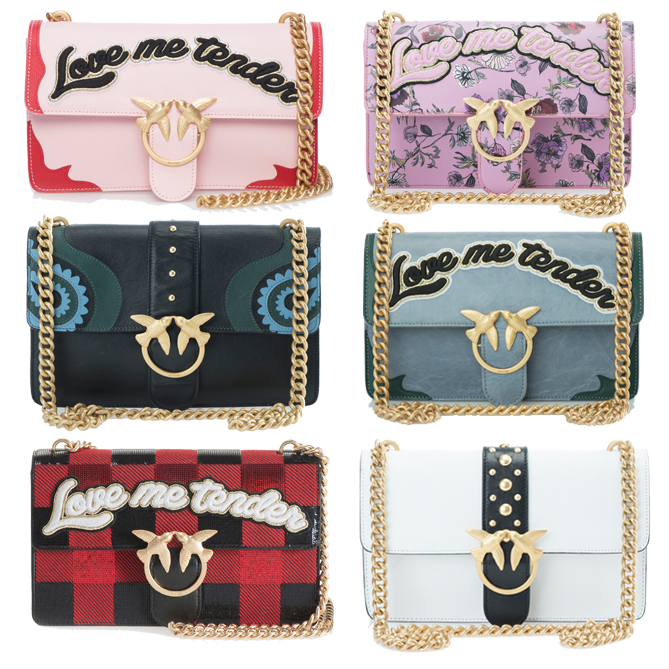 Half of the bags come with a 'Love me tender' embroidery, making a reference to Elvis Presley's world-famous song from the 50s. Especially the pink and red bag above shows that the 50s have also been an inspiration for the design of the 'Love Bags'. Those who want to play it safe can opt for one of the monochrome bags, but all others should go all in and don't hesitate to combine a flower bag with more flower prints or one of the green/blue ones with emerald-green velvet. Also why not opt for a 50s all over look, inspired by The King himself? All that you need to provoke major bag envy on Instagram are around 300€. Still a bargain compared to Gucci's Dionysus, right? Shop all 'Love Bags' here.